First up is Joe (Crotalus) from Harrisburg, PA. Joe’s lucky enough for a desk at home and a tying station in the fifth wheel. 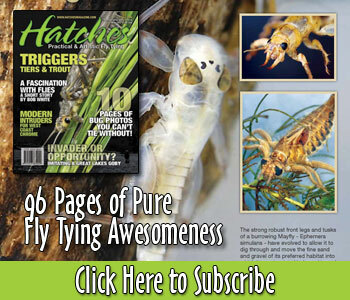 Love to see the current issue of Hatches has a place on the table! Don has one of the more comfortable tying setups we’ve seen. Don says “I’ve upgraded to an Oasis bench (love it); however, I still use this set up from time to time!”. That is a pretty awesome 2nd bench!